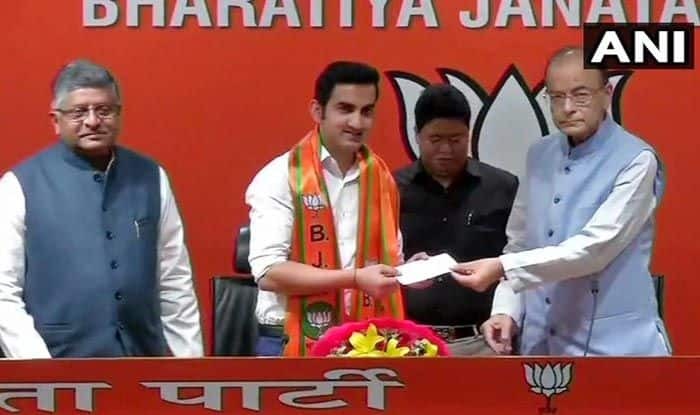 Fomer Indian cricketer Gautam Gambhir has joined BJP and will be fielded from the New Delhi constituency, which was won by the BJP's Minakshi Lekhi in 2014. Retired Indian cricket team batsman Gautam Gambhir shifted his allegiance to politics when he joined the Bharatiya Janata Party in New Delhi on Friday. He was inducted in the presence of Union Ministers Arun Jaitley and Ravi Shankar Prasad and will be fielded from the New Delhi constituency, which was won by the BJP’s Minakshi Lekhi in 2014. Gambhir played a pivotal role in India’s historic victories in the inaugural edition of ICC World T20 and also during the ICC World Cup 2011, he played match-winning knocks of 75 (against Pakistan) and 97 (against Sri Lanka) which helped the men in blue to lift the world titles. Overall, Gambhir played 58 Tests, scoring 4154 runs, at an average of 41.95, including nine centuries and 22 fifties. He played 147 ODIs, scoring 5238 runs at an average of 39.68 and a strike-rate of 85.25. The 37-year-old’s cricketing career can be judged from the fact that he achieved the numero uno rankings in cricket’s most traditional format (Test cricket) in 2009. He was also ranked No.1 T20I batsman in the world in 2007. While in ODIs, Gambhir achieved his career-best 8th rank in the limited-overs format. Pataudi, a former Indian skipper, was among the first of the cricketers who joined politics and contested polls. Regarded as one of India’s greatest cricket captains, the nawab contested two Lok Sabha polls and tasted defeat. A minister in Punjab government, Sidhu started his political career by contesting the Lok Sabha elections in 2004 on a BJP ticket. In February 2007, he again contested the Lok Sabha bye-election from Amritsar and emerged victorious. Sidhu, who featured in 51 Tests and 136 ODIs for India, has donned several hats in his political career. In 2014, the BJP denied him a ticket and gave the seat to the party’s key strategist Arun Jaitley. He was defeated by Punjab Chief Minister Captain Amrinder Singh. In 2016, he was given the Rajya Sabha ticket but he resigned. He along with Pargat Singh and Bains brothers formed a new political front — Aawaaz-e-Punjab — claiming to fight against those working against Punjab. In January 2017, Sidhu joined Congress. Contesting from Amritsar East in the 2017 Punjab Assembly elections, he won by a margin of 42,809 votes. He was appointed to the Punjab cabinet. The former all-rounder, who was part of the 1983 World Cup-winning squad, represented the BJP and won from Bihar’s Darbhanga constituency thrice. In February 2019, he joined the Congress. Son of former Chief Minister of Bihar Bhagwat Jha Azad, Kirti Azad was an aggressive right-hand batsman and a quickish off-spinner. He was previously an MLA from Delhi’s Gole Market constituency. Chetan Chauhan, who was Sunil Gavaskar’s opening partner in Tests, has twice been a Member of Parliament from Amroha constituency in Uttar Pradesh. He retired from international cricket after scoring 2,000 test runs without any century. After his cricket career finished in 1981 he moved into politics, joining the Bharatiya Janata Party. He is serving as Minister for Youth and Sports in Uttar Pradesh. Mohammad Kaif, who featured in 125 ODIs and 13 Tests between 2000 and 2006, joined Congress and contested 2014 Lok Sabha election from Phulpur in Uttar Pradesh. He was defeated by BJP’s Keshav Prasad Maurya, who is Deputy Chief Minister in the state. He is regarded as one of the best fielders in the Indian cricket team owing to his great athletic and throwing skills. He retired from all formats of cricket on July 13, 2018. He is at present the most prominent face of a cricketer-turned-politician. The former Pakistan captain was last year elected the country’s Prime Minister. Imran, who led Pakistan to its only World Cup title in 1992, last July won the most seats in the elections for his Pakistan Tehreek-e-Insaf party. Arguably Sri Lanka’s greatest captain-ever, Arjuna Ranatunga joined politics after retiring and has been a Member of the Parliament of Sri Lanka for Gampaha constituency. In 2015, he was appointed as the Minister of Ports and Shipping having earlier held the post of Sri Lanka’s Deputy Minister for Tourism. Ranatunga’s 1996 World Cup-winning team-mate and one of the most devastating openers that cricket has seen, Sanath Jayasuriya was elected as Member of Parliament from his native Matara district for one full term and has served as the Deputy Union Minister of postal services and later as the Deputy Union Minister of Local Government and Rural Development under president.